We’re sure you’ve spent the summer holidays encouraging the kids to get out and about and keep active – well this doesn’t have to stop when they return to school. There are plenty of activities that you can get involved in together, whether it’s at home or outdoors. Make sure you make the most of your weekends and the last of the lighter evenings to get your daily dose of exercise in! To help you keep that fitness momentum, we’ve created some top tips to keep those healthy habits going into Autumn and don’t forget we’ve got over 100 shops that cater for all your healthy lifestyle needs! Why not set up a miniature circuit track in the garden for the family. Split the garden, or the living room if the weather is bad, into four stations and give each station a different exercise. 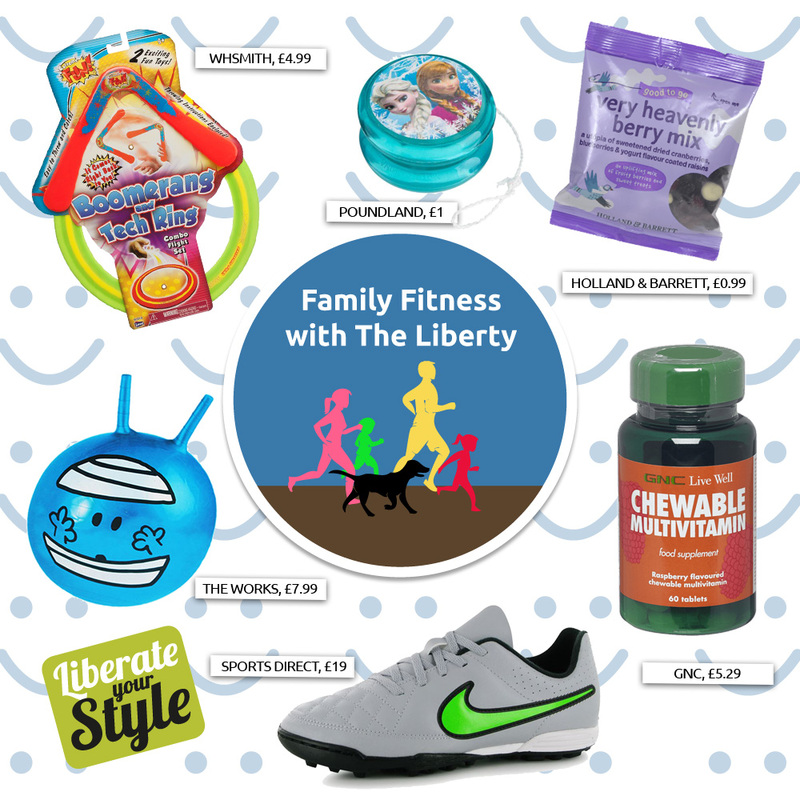 WHSmith and The Works both have a great range of fitness accessories, so you can get whole family working out for less than £10! This Boomerang and Tech Ring Combo from WHSmith is just £4.99 and this Mr Men space hopper from The Works is also a great way to get started at £7.99. Send the kids off to school with some healthy packed lunch treats that will fill them up with good energy and keep their brains engaged during those first few weeks back behind their desks! We love these ‘Good to Go’ Snackpacks from Holland & Barrett, available in a range of flavours for 99p each. If the kids need any new sports kit for PE lessons at school, Sports Direct is a great place to pick up apparel and equipment that doesn’t break the bank. These Nike Tiempo Rio Astro Turf Shoes are available in a range of junior sizes from just £19.00. Set your family a range of challenges to complete each weekend, such as a 5km jog or bike ride or a long walk in a local park. When each challenge is completed, a different member of the family gets to choose a reward. Poundland offer an extensive range of fun toys, stationary and arts and crafts supplies, perfect for treats! This Disney Frozen Yoyo is just £1.00. Support your families diet with a high quality, multi vitamin tablet – a tasty and palatable way to ensure your little ones are getting everything they need. Kids (and adults) will love these Chewable Raspberry Flavour Multivitamin Tablets from GNC, £5.29 for 60 tablets.